The actual sign said “George’s,” above the motto, but I couldn’t get it with my phone without stepping out into the street. 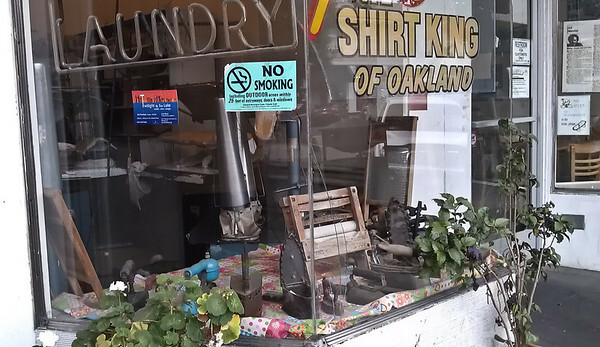 The window caught my eye because of the old laundry equipment. You can’t see it from this angle, but the iron with its cover flipped back is full of charcoal briquettes (probably originally lumps of coal); that’s how you ironed laundry before electricity. A friend of mine once lived on a boat – when I visited them I saw her Coleman iron, a mid-20th century version of the coal-fired iron. Hers was more modern looking than the ones on eBay but it still had its pressurized tank of white gas. Next to the coal-fired iron is its predecessor, a flatiron – you had two of those, one to sit on the stove and heat up while you ironed with the other. The wringer, of course, is obvious; and though it’s hard to see, there is a washboard tilted against the left side of the window. The blue thing that looks like a pistol is (I think) an old sewing machine. Why am I so interested in old laundry equipment? According to family legend, once upon a time my grandmother supported her five kids by taking in laundry and washing it “on the board.” These were all tools she might have used. Thank God I never had to do that! This entry was posted in Neighborhood, Photography and tagged Oakland, Phonepix.